A big thank you to Craftsy for sponsoring this eGuide and post! You can read my full Disclosure Statement here. 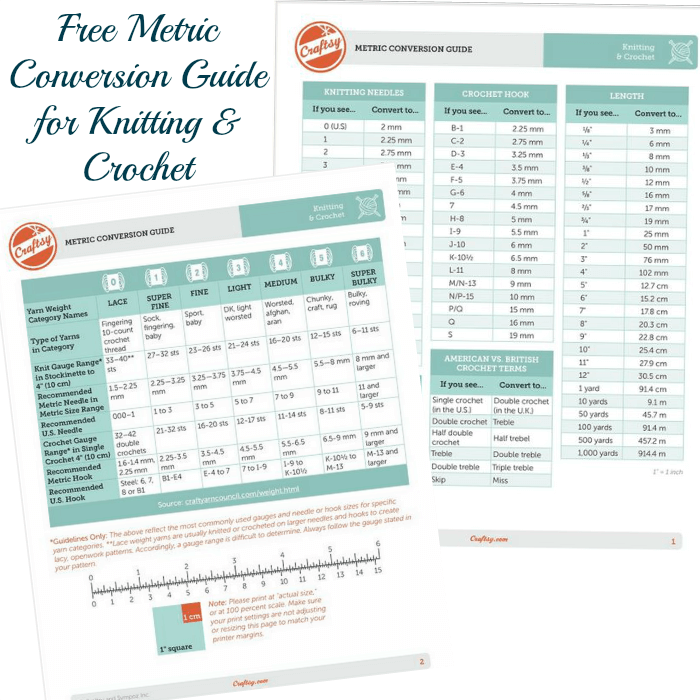 Staying true to their mission of providing creative education and tools, Craftsy is helping overcome knit and crochet borders with their handy metric conversion guide! Now you can tackle that pattern from “across to pond” with ease. The two-page guide is laid out in an easy-to-use format that will help you convert hook and needle sizes between US sizes and their metric equivalents at a glance. The quick view charts make patterns easy to navigate with British to American crochet terms and measurements and yarn weight conversions. And best of all it’s FREE! Download your free metric conversion guide by clicking here. Kara, thanks so much for sharing this. I’ve been looking for a good conversion chart! Thank you for this wonderful link. Really helpful.